Are you sick and tired of driving to the nearest commercial tanning bed to maintain that dark tan year round? 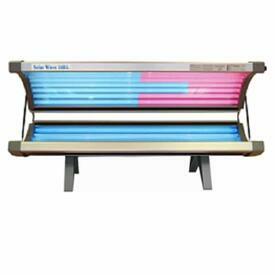 Bring that luxury home with Family Leisure's 16 Bulb Tanning Beds! They help promote your body's natural production of Vitamin D, can prevent certain forms of cancer, strengthen bones, boost your self-confidence, help seasonal affective disorder and clean up and prevent acne! All of our options showcase attractive features such as full-body polished reflectors and 1,000 hour lamp life! Many of thesemodels feature special add-ons, such as decorative skirts, LED digital timers with lamp hour counters and ESB dual power (pink and blue) Sunergy lamps that offer two levels/areas of tanning! Divide the power level in your sunshine machine by focusing power on the facial lamps, while decreasing the arm and body lamps! Looking to save some cash? All 16 lamp bedss offer energy-efficient electronic ballasts that consume 40% less energy.